Below is a list of confirmed public concert dates for 2019. See also private events. To see what you missed in previous years, visit the events past page. 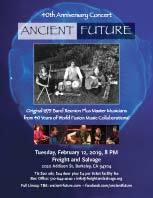 Tuesday, Feburary 12, 8 PM, Ancient Future 40th Anniversary Concert and Bandleader Birthday Party, Freight and Salvage, 2020 Addison Street, Berkeley, CA 94704. Press Release. Wednesday, February 20, 7 PM, Ancient Future History with Matthew Montfort (scalloped fretboard guitar), Mindia Devi Klein (bansuri and silver flute), and Mariah Parker (santur), Petaluma Regional Library, 100 Fairgrounds Dr., Petaluma, CA 94952. Free. Info: 707-763-9801 or visit sonomalibrary.org. Press Release. Facebook Event. Friday, March 8, 8 PM, Global Guitar Summit with Matthew Montfort (scalloped fretboard guitar) and Teja Gerken (fingerstyle guitar), Wu Wei Tea Temple, 1820 Sir Francis Drake Blvd, Fairfax, CA 94930. No cover. Suggested donation: $10 - $20. Info: visit wuweiteatemple.com. Facebook Event. Saturday, March 9, 3 PM, Global Guitar Summit with Matthew Montfort (scalloped fretboard guitar) and Teja Gerken (fingerstyle guitar), Guerneville Regional Library, 14107 Armstrong Woods Rd., Guerneville, CA 95446. Free. Info: 707-869-9004 or visit visit sonomalibrary.org. Press Release. Facebook Event. Saturday, March 30, 2 to 3 PM, Ancient Future World Without Walls Trio with Matthew Montfort (scalloped fretboard guitar), Doug McKeehan (keys), and Ian Dogole (percussion), Northwest Santa Rosa Library, 150 Coddingtown Center, Santa Rosa, CA 95401. Free. Info: 707-546-2265 or visit sonomalibrary.org. Press Release. Facebook Event. Saturday, April 20, 2 to 3 PM, Ancient Future Guitar and Arabic Percussion Duet with Matthew Montfort (scalloped fretboard guitar) and Antoine Lammam (Arabic percussion), Central Santa Rosa Library, 211 E Street, Santa Rosa, CA 95404.Free. Info: 707-308-3020 or visit sonomalibrary.org. Press Release. Facebook Event. Saturday, April 27, 2 to 3 PM, Ancient Future Guitar and Pipa Duet with Matthew Montfort (scalloped fretboard guitar) and Shenshen Zhang (pipa), Sonoma Valley Regional Library, 755 West Napa Street, Sonoma, CA 95476.Free. Info: 707- 996-5217 or visit sonomalibrary.org. Press Release. Facebook Event. Saturday, May 4, 2 to 3 PM, Ancient Future Guitar and Tabla Duet with Matthew Montfort (scalloped fretboard guitar) and Vishal Nagar (tabla), Rohnert Park-Cotati Library, 6250 Lynne Conde Way, Rohnert Park Expressway / State Farm Drive, Rohnert Park, CA 94928.Free. Info: 707-584-9121 or visit sonomalibrary.org. Press Release. Facebook Event. Saturday, May 11, 2 to 3 PM, Ancient Future World Without Walls Trio with Matthew Montfort (scalloped fretboard guitar), Doug McKeehan (keys), and Ian Dogole (percussion), Healdsburg Regional Library, 139 Piper Street, Healdsburg, CA 95448.Free. Info: 707-433-3772 or visit sonomalibrary.org. Press Release. Facebook Event. 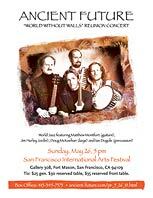 Sunday, May 26, 2019, 5 PM, Ancient Future World Without Walls Reunion (lineup that recorded World Without Walls and Asian Fusion), San Francisco International Arts Festival, Gallery 308, Fort Mason, San Francisco, CA 94109. Sunday, February 10, 2019, 10:10 PM, Matthew Montfort is interviewed on Frequency Uplift on KXSF.FM, San Francisco, about Ancient Future's 40th Anniversary. Listen to the archived show at kxsf.fm/frequency-uplift-podcasts.html. Thursday, February 7, 2019, 10 PM, Ancient Future performs live on Hear and Now on KPFA, 94.1 FM, Berkeley CA 94704. The archived broadcast is available for two weeks. Sunday, February 10, 2019, Matthew Montfort is interviewed on Frequency Uplift on KXSF.FM, San Francisco, about Ancient Future's 40th Anniversary. Listen to the archived show at kxsf.fm/frequency-uplift-podcasts.html. Due to decades of arts cutbacks, many of the presenters most supportive of world fusion music have suspended operations or are cutting their seasons. This trend is expected to accelerate in the current political climate. For our 39th season, we need your help more than ever to replace lost operating income caused by diminished arts support. More info.